Most cities and counties require permits for exterior construction and electrical circuits. In addition, some communities have codes requiring residential barriers such as fencing and/or self-closing gates on property to prevent unsupervised access to the property by children under the age of 5. Your dealer can provide information on which permits may be required and how to obtain them prior to the delivery of your spa. For additional operating and installation information, please see your selling dealer. Do not place your spa within 10 feet (3 m) of overhead power lines. 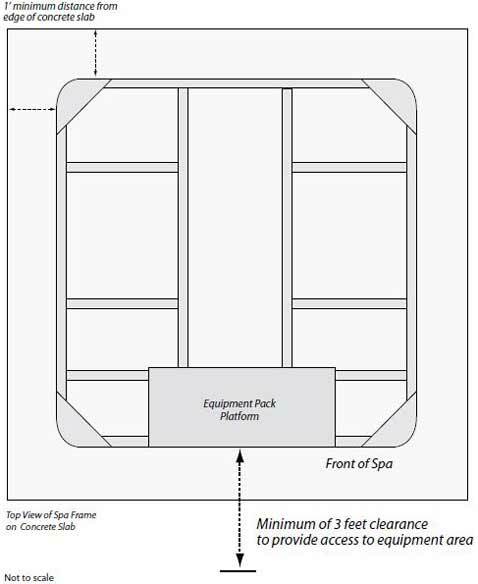 Make sure the spa is positioned so that access to the equipment compartment and all side panels will not be blocked. Be certain that your installation will meet all city and local safety codes and requirements. How you intend to use your spa will help you determine where you should position it. For example, will you use your spa for recreational or therapeutic purposes? If your spa is mainly used for family recreation, be sure to leave plenty of room around it for activity. If you will use it for relaxation and therapy, you'll probably want to create a specific mood around it. If you live in a region where it snows in the winter or rains frequently, place the spa near a house entry. By doing this, you will have a place to change clothes and not be uncomfortable. In a cold-weather climate, bare trees won't provide much privacy. Think of your spa's surroundings during all seasons to determine your best privacy options. Consider the view of your neighbors as well when you plan the location of your spa. Think about the direction you will be facing when sitting in your spa. Do you have a special landscaped are in your yard that you find enjoyable? Perhaps there is an area that catches a soothing breeze during the day or a lovely sunset in the evening. Prevent dirt and contaminants from being tracked into your spa by placing a foot mat at the spa's entrance where the bathers can clean their feet before entering your spa. You may also consider keeping a small water-filled basin nearby for bathers to rinse their feet before entering your spa. In planning your spa's location, consider a location where the path to and from the house can be kept clean and free of debris. Many people choose to install a decorative structure around their spa. If you are installing your spa with any type of structure on the outside, such as a gazebo, remember to allow access for service. It is always best to design special installations so that the spa can still be accessed. Your spa needs a solid and level foundation. The area that it sits on must be able to support the weight of the spa, with water and the occupants who use it. If the foundation is inadequate, it may shift or settle after the spa is in place, causing stress that could DAMAGE YOUR SPA SHELL AND FINISH. Damage caused by inadequate or improper foundation support is usually not covered by a warranty. It is the responsibility of the spa owner to provide a proper foundation for the spa. We strongly recommend that a qualified, licensed contractor prepare the foundation for your spa. If you are installing the spa indoors, pay close attention to the flooring beneath it. Choose flooring that will not be damaged or stained. If you are installing your spa on an elevated wood deck or other structure, it is highly recommended that you consult a structural engineer or contractor to ensure the structure will support the weight of 150 pounds per square foot. To properly identify the weight of your new spa when full, remember waster weighs 8.33 lbs. per gallon. For example, an average 8' spa holds approximately 500 gallons of water. Using this formula, you will find that the weight of the water. Using this formula, you will find that the weight of the spa you will note that this spa will weigh approximately 5,000 lbs. when full of water. Your Cal Spas retailer can help you with your foundation and more. Your retailer has a wealth of information and experience about how to get the most out of your spa and can provide you with a full line of accessories that are designed to complement your spa and increase your enjoyment. While you are planning where to locate your spa, you need to determine how much access you will need for service. All Spa models require access to the front of the spa for periodic service. For this reason, the spa should never be placed in a manner where the front is permanently blocked. Examples include placing the front of the spa against a building, structural posts or columns, or a fence. For some spa models, the sides and the back do not require service access and can be placed where you wish, provided the spa is on a 3"-4" concrete slab. See the figure on the next page. Other spa models require access to the sides or rear should if they ever need service or repair. If you are planning to enclose or surround your spa with a deck, make sure there is access for service or repair. The location of the electrical service cable is a decision each spa owner needs to decide. Running the electrical cable lay on top of the slab is visually unappealing and can present a trip hazard. Most spa owners prefer to bury electrical conduit before the slab is laid and run the cable into the spa cabinet. The location of the conduit in the concrete slab is called the stub-up. We do not recommend the stub-up extending higher than 4" above the concrete slab. Spas equipped with a pump in the left corner will need to have a hole drilled in the spa's equipment pack platform to allow the electrical wiring to pass through. Models ES534L, ES625T, FA581R, FA520L, G418T, and G318R -For these spas, the stub-up can be located in the left or right front corner without interference with spa equipment. F1770 -See the next image for electrical stub-up information for this model. 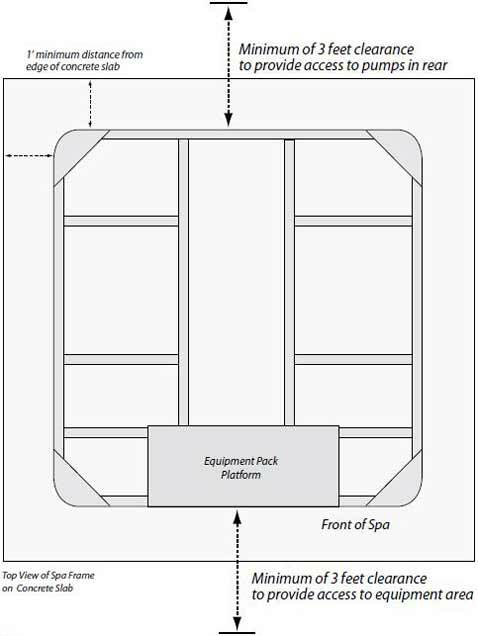 Check your spa's model and its dimensional as it sits on the delivery cart. During delivery, the spa must remain on the delivery cart at all times. During delivery, the spa must remain on the delivery cart at all times. Compare the dimensions to the width of the gates, sidewalks, and doorways along the delivery route. It may be necessary for you to remove a gate or partially remove a fence in order to provide an unobstructed passageway to the installation location. Check the width of the gates, doors and sidewalks to make sure your spa will pass through unobstructed. You may have to remove a gate or part of a fence to allow for adequate width clearance. If the delivery route will require a 90 âÂÂÂÂ° turn, check the measurements at the turn to ensure the spa will fit. 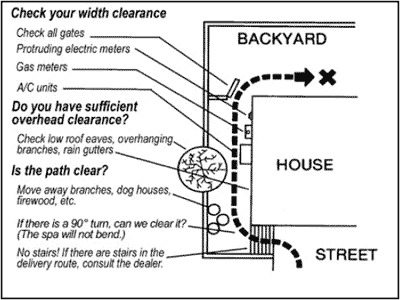 Are there protruding gas meters, water meters or a/c units on your home which will cause obstructions along the delivery path to your yard? All 240V spas must be permanently connected (hard wired) to the power supply. 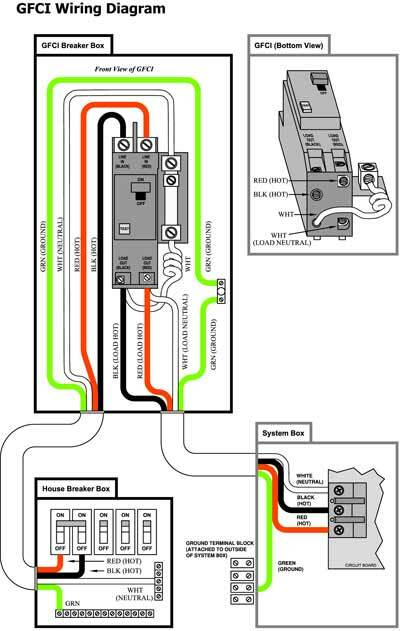 See the wiring diagram below. These instructions describe the only acceptable electrical wiring procedure. Spas wired in any other way will void your warranty and may result in serious injury. 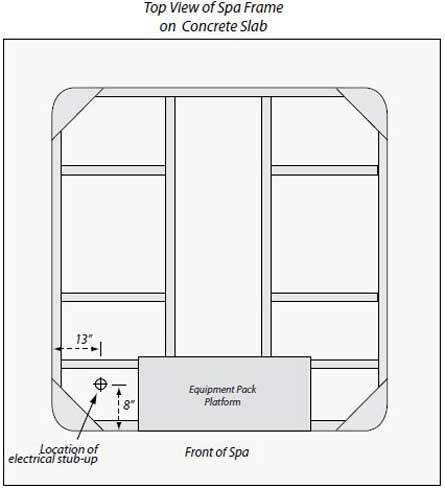 When installed in the United States, the electrical wiring of this spa must meet the requirements of NEC 70 and any applicable local, state and federal codes. The electrical circuit must be installed by an electrical contractor and approved by a local building or electrical inspector. Failure to comply with state and local codes may result in fire or personal injury and will be the sole responsibility of the spa owner. The power supplied to the spa must be on a dedicated GFCI protected circuit as required by NEC 70 with no other appliances or lights sharing the power. Use copper wire with THHN insulation. Do not use aluminum wire. Use the table below to determine your GFCI and wiring requirements. Wire runs over 85 feet must increase wire gauge to the next lower number. For example: A normal 50 amp GFCI with four #6 AWG Copper wires run over 85 feet would require you to go to four #4 AWG copper wires. All 5100DV and 6200DV control systems are set at the factory to run on the low power setting for 40 amp operation. This is the default setting. Spa owners can have their installer change this setting so the spa will run on high power for 50 amp operation. Warning: Never set a spa to run on high power without installing a properly rated GFCI. DIP Switch definitions for 5100DV, 6200DV and 6300DV systems. This applies to fitness spas with 11 kW heater only. 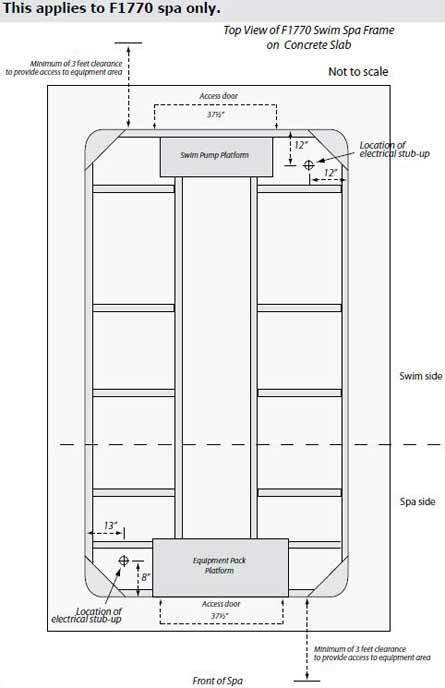 Two electrical services are required to heat the swim side of the fitness spa. Press the RESET button on the GFCI. The GFCI will reset and the spa will turn back on. The Spa is now safe to use. If the GFCI trips while the spa is in use, press the RESET button. If the GFCI does not reset, unplug the spa and call your local Spa dealer for service. DO NOT USE THE SPA! Always follow applicable local, state and federal codes and guidelines. Use only a dedicated electrical line with a 20-amp breaker. Cord-and-plug connections may not use a cord longer than 15 ft. (4.6 m) and must be plugged into a dedicated 20-amp GFCI connection. Do not use extension cords! Always use a weatherproof-covered receptacle. Receptacles shall be located not less than 5ft (1.5 m) from and not exceeding 10ft (3.0 m) from the inside wall of the spa. Do not bury the chord. If your cord becomes damaged, replace it before next usage. All 120V spas must have a GFCI. This can be either a 20-amp GFCI receptacle or a GFCI cord and plug kit as shown at right (CKIT110-p/nele09700086).